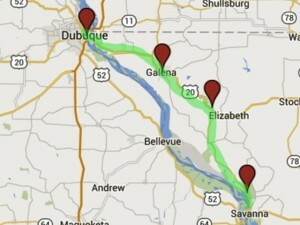 Previous River Road Travel Page: Quad Cities to Thomson, Illinois. North of Palisades Park, the River Road begins to turn away from the river as the road climbs up to the ridge of high ground several hundred feet above the river bed. Where highway 84 joins highway 20, there is an abandoned observation tower that offered a terrific view of the surrounding countryside. While the tower is now closed for safety reasons, there remains a picnic area there and still some impressive views from the high ground surrounding the tower. Galena Illinois, a former Mississippi River Steamboat Capital, is full of historic buildings and interesting shops and parks. 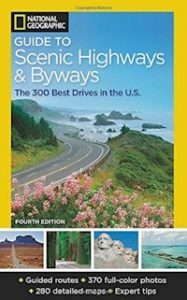 Highway 20 now becomes the river road and rides the ridge all the way to Galena, Illinois a town loaded with historic buildings, artisan and craft shops, interesting restaurants, and other attractions, including the former home of President Ulysses S. Grant. At one time Galena was a major Mississippi River port community, even though technically it is on the Galena River not the Mississippi. But back in the day, the Galena River was a more significant tributary than it is now and hosted numerous paddlewheel pleasure craft and commercial shipping. The downtown is still protected by a massive dike and gate system as the town was victim to regular floods of the Galena River. Highway 20 actually skirts the west side of Galena and avoids the historical district. 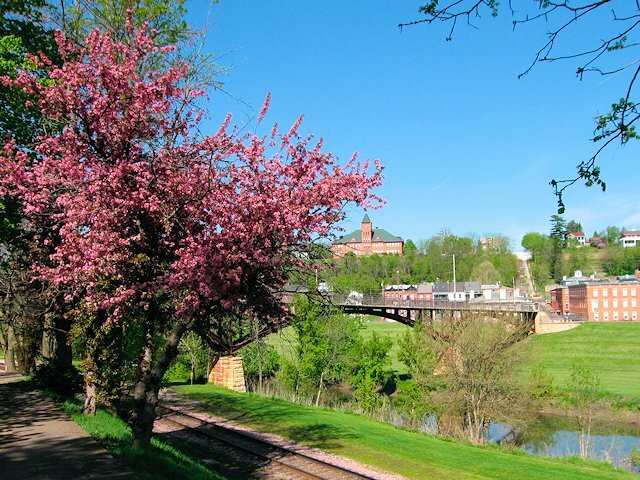 It is an exceptional town so we encourage River Road travelers to spend some time downtown getting to know Galena. We’ve visited the town on several occasions and provide several pages of interesting things to see and do in Galena here. As you continue on Highway 20 through Galena you’ll arrive in East Dubuque, Illinois and if you stay on Highway 20 cross the bridge into Dubuque, Iowa, another historic Mississippi River port town rich in history and in modern day attractions. We love their Riverwalk and the Bluff Street artisan neighborhood. Dubuque is also home to the Mississippi River Museum and Aquarium, a place we find ourselves visiting frequently. Undergoing an impressive renaissance with new industries and entertainment venues and a re-vitalized waterfront district, while doing a good preserving ties with its historic past. 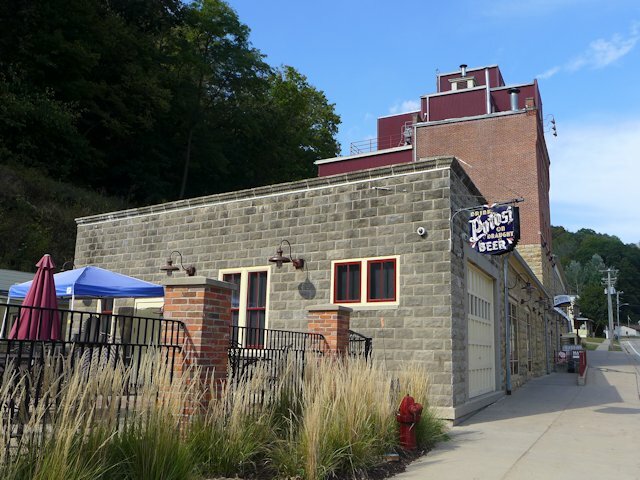 We visit Dubuque regularly and have profiled some Dubuque’s Visitor Attractions here. We’ve also done an article on Dubuque’s Public Golf Courses. Grant River Army Corps RV Park near Potosi, Wisconsin is one of our favorites. We often stay there when visiting Dubuque, Iowa. North of Dubuque it is difficult to choose whether one takes the Wisconsin Great River Road or the Iowa Great River Road. 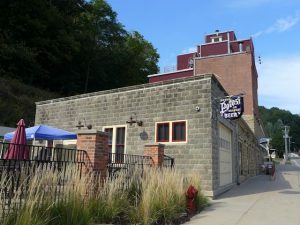 On the Wisconsin side, you have the restored Potosi Brewery as a significant attraction and the nearby excellent Grant River Corps of Engineers Park for RV travelers. 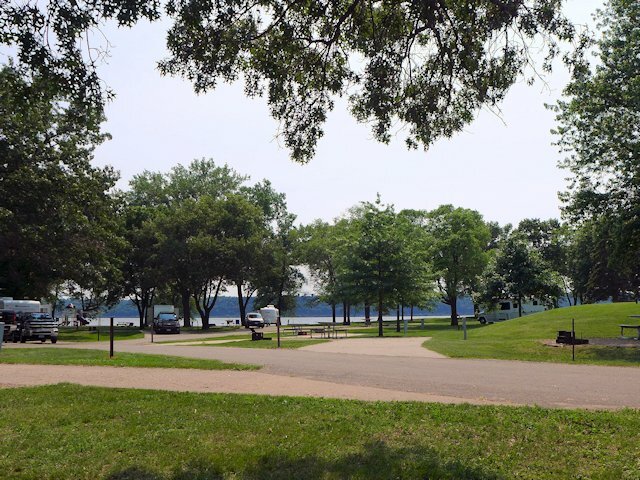 The park offers 63 RV sites with electric hookups, washrooms/showers, playgrounds, a scenic parkway along the main branch of the river, and other amenities. Another attraction on the Wisconsin side is in Cassville, Wisconsin: Nelson Dewey State Park and its companion Stonefield Historic Site. Another Cassville attraction is the Cassville Ferry which crosses the Mississippi and docks on the Iowa side at Millville and the Turkey River Boat Landing, giving you the option to continue your journey north on the Iowa side of the Great River Road. Leaving Dubugue on the Iowa side. Go north from Dubuque along the Iowa River Road (Highway 52) and then take County Road CY9 (Sherill and Balltown Roads) to Balltown Iowa with its scenic lookouts and historic Breitbach Tavern, the oldest continually operating tavern in the state of Iowa. 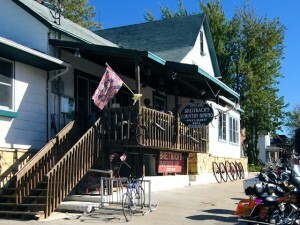 The Breitbach Tavern, Iowa’s oldest continually operating tavern, is famous for its home-cooked food and friendly service. Just down the street is the Balltown Scenic Overlook, the highest point on the Iowa side of the Mississippi River. Leaving Balltown, you descend along CY9 to the riverside community of North Buena Vista. Continuing along CY9 (Iowa Great River Road) you pass the Turkey River Mounds State Preserve, which also hosts the boat landing for the Cassville Ferry. Shortly after this point the Great River Road re-joins Highway 52 and heads towards Guttenberg Iowa whose attractions include an interesting DNR Mississippi River Fish Aquarium and Hatchery, the Lockmaster House Heritage Museum, a 2 mile long riverwalk and Ingleside park. Just north of Guttenberg, if you want to travel near the river, take County Road X56 which ends at McGregor, Iowa. You’ll pass Pikes Peak State Park just before arriving in McGregor. There are some fantastic scenic lookouts at this park and a nice little hiking trail that takes you by a waterfall. The park has 77 campsites, 60 with electric service, a modern bathroom/shower facility, dump station, and a park store and pavilion. Half the sites are held out for first come, first served and the other half can be reserved in advance. So for this stretch of the river road to Prairie du Chien, Wisconsin and sister city across the river McGregor-Marquette, Iowa, we think the Iowa river road is more scenic, providing more views of the river valley than the Wisconsin route. But further north of Prairie du Chien, we think the Wisconsin road is more scenic. See our complete Upper Mississippi River Road Map here.